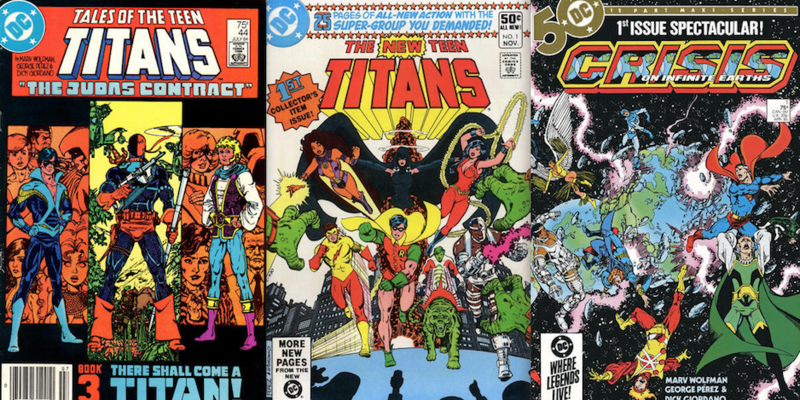 Marv Wolfman made an enormous impression on me as a teenager, chiefly through three of his innovations with artist George Perez — the creation of The New Teen Titans; Robin’s switch to Nightwing; and Crisis on Infinite Earths. His voice and sense of storytelling scope were perfectly attuned to where I was as a reader then — and now. I had a chance to talk to Wolfman a little while back at East Coast Comicon when I hosted his discussion panel. I’ve been holding onto the transcript, waiting for the right time to launch our latest creator interview series. Now’s the perfect time: Wolfman turns 72 as I post this, so this is a bit of a Happy Birthday to someone whose work affected me so acutely. The interview will be broken up in five parts in the weeks ahead and I’ll be updating this post with the links so you can follow along. And though Wolfman’s achievements go well beyond what I mentioned above — I was also a big fan of his post-Crisis Superman, for just one example — Titans, Nightwing and Crisis will be the prime areas of discussion. There was no way I was going to let him off the hook without really getting into those stories that knocked me out all those years ago — and have stayed with me ever since. — The Creation of NIGHTWING. Click here. — Wolfman’s Favorite NEW TEEN TITANS Stories. Click here. — Crafting THE JUDAS CONTRACT — and the Irredeemable TERRA. Click here. — Why Wolfman Didn’t Like the Ending to CRISIS ON INFINITE EARTHS. Click here.